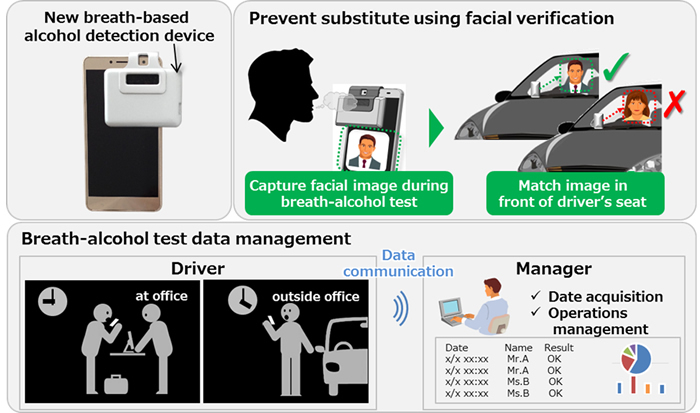 Tokyo, June 12, 2017 --- Hitachi, Ltd. (TSE: 6501, Hitachi) today announced the development of a prototype system for a new breath-alcohol detection device equipped with facial recognition, and verification field tests with Hitachi Capital Auto Lease Co., Ltd. (Hitachi Capital Auto Lease). After developing a prototype portable breath-based alcohol detection device in March 2016*1, Hitachi has been pursuing research to increase the reliability of the sensor, reduce its size, and develop application software. In March 2017, a field test was launched with a prototype equipped with a function to collect and manage drivers' alcohol test data on smartphones. From August 2017, a new detection device which recognizes whether or not the person who underwent the alcohol test is the same person as the driver is expected to be introduced to prevent abuse by substitution (figure). Through the field tests involving employees at three sales offices of Hitachi Capital Auto Lease, the functionality and performance of the device will be verified as well clarifying other potential issues to enhance the reliability and usability in preparing for commercialization. In March 2016, Hitachi and Honda R&D Co., Ltd. developed a prototype portable breath-based alcohol detection device with the aim of eliminating alcohol-related accidents. While this prototype provided the convenience of allowing the test to be taken anywhere, and prevented tampering by being able to distinguish whether or not the sample submitted was human breath, issues were identified such as the possibility of abuse by a substitute taking the test in place of the actual driver, and the need to be able to centrally manage test data from each driver in fleet situations. The size of the new prototype detection device was reduced to about one-third that of the previous prototype by eliminating the battery and related circuits, while maintaining the same accuracy for alcohol detection. This made it possible to attach the prototype to a smartphone. Application software developed linked the two, enabling facial recognition technology to be employed. Users attach the detection device to their smartphones, and then initiate the software to take the alcohol breath test during which time a facial image is simultaneously captured. After taking the test, the smartphone is placed in a holder located in front of the driver's seat and another photograph of the driver is captured. The image of the person who took the test is then matched with that of the driver to confirm identity thus preventing substitutes from taking the alcohol breath tests. Application software was developed to transmit the breath-based alcohol test results from the detection devices to smartphones and aggregate the data. Safety administrators can download the log data related to aggregated time of test, presence or absence of alcohol, mobile terminal ID, etc. to a smartphone or PC, thus raising management efficiency and enabling remote management of alcohol inspection. Through the field tests, Hitachi and Hitachi Capital Auto Lease are working to enhance the reliability and usability of the breath-alcohol detection system, with the aim of commercialization. 24 March 2016 Hitachi News Release: "Hitachi and Honda Successfully Develop Prototype of Portable Breath-based Alcohol Detection Device for Vehicle Smart Keys"
Hitachi Capital Auto Lease Corporation (Hitachi Capital Auto Lease) is a group company of Hitachi Capital Corporation (President & CEO: Seiji Kawabe) providing automobile leasing and ancillary services to corporate customers including the Hitachi Group through a network of 18 locations in Japan. As of the end of March 2017, Hitachi Capital Auto Lease is entrusted with the management of approximately 93,000 vehicles, including providing 210 Hitachi Group companies in Japan with approximately 2,000 car leases every year as well as the management of approximately 18,000 vehicles.